The planet Jupiter is once again a source of surprise and wonder to many a night-sky-gazer, as it has been many times since before recorded history, refreshing the age-old human experience of this bright celestial beacon as a "wandering star" ever on the move among the stars. Jupiter forms one vertex of a triangle with the stars Castor and Pollux—the twins of Gemini--high in the eastern sky. I have received more than a few emails and phone calls from inquisitive people prompted by the sighting of a "UFO" high in the east. None of them suggested that they had seen a flying saucer, but were nevertheless mystified. In fact a couple of people were quite insistent that the apparition was certainly not a star or a planet. I understand the feeling; the same thing happened to me in my teens when I happened to look up one night and see, as if for the first time, the star Sirius, the brightest star in the night sky. It was so bright, and flashed prismatically with so many colors as its light sliced through Earth's atmosphere, that I could barely believe I was looking at a normal star. When we look up and see something we may not have noticed before, or which may be presented in an unusually prominent situation, we can be quite puzzled by what we are viewing--even though it might be something we have seen before, but in a different light. Even as our brains try to classify the object--as a bright planet, a bright star, or maybe even an exploding star (which is one of the possibilities I assigned to Sirius on that night long ago)--the wonder and awe we feel can be electrifying. It was 404 years ago this week that Galileo Galilei experienced the puzzlement and awe of a new celestial wonder—and in this case it was truly something that neither he nor anyone else had ever beheld. The invention of the telescope was brand new, and its use as a tool to scry the hidden secrets of the heavens even newer, Galileo being the first to do so. In January 1610, Galileo aimed his telescope at Jupiter and discovered its large moons, the Galileans, which are just beyond the grasp of the unaided human eye to perceive. At first he thought the tiny dots might be background stars, but in the course of observing them on subsequent nights Galileo saw that not only did they move with Jupiter, they constantly changed their relative positions as they apparently orbited the planet. After visits by seven spacecraft—six fly-by missions and one orbiter, the Galileo probe—we have revealed many of the wondrous secrets about Jupiter and its moons. 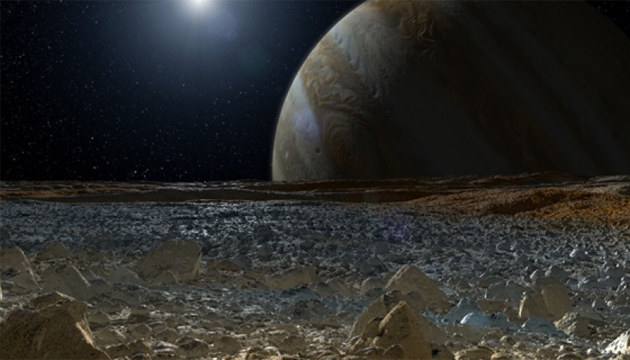 Not only is Jupiter by far the largest planet in our solar system, containing more matter than the rest of the planets combined, it possesses the largest moon (Ganymede), the most volcanically active body (Io), the oldest surface (Callisto), and the greatest known liquid-water ocean (Europa). The adventure continues with NASA's Juno spacecraft, currently on its final course to enter orbit around Jupiter in 2015 on a mission to study its polar regions and even probe the yet unseen reaches of its interior. Galileo's report of seeing Jupiter's moons must have been like a modern UFO sighting—though in his time it was agents of the church in Rome, and not men-in-black driving unmarked vans, who showed up to silence the witness.